Email ’n Walk frightens me. 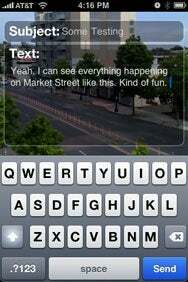 Eyes on the Road: Email ’n Walk uses the iPhone’s camera to let you see what’s in front of you as you type e-mails. Note that I’m using this while walking, and not behind the wheel of a car. Don’t get me wrong, the iPhone application from Phase2 Media is clever and innovative, allowing users to compose e-mails while simultaneously using the phone’s built- in camera to see what’s directly in front of them. No, what scares me about Email n’ Walk are the possibilities. Email ’n Stalk. Email n’ Drive. Even Email ’n Walk Into Traffic On A Major Thoroughfare is a chilling scenario. While the app theoretically improves user safety—I’m sure many of us have nearly been run over by a pedestrian paying more attention to his phone than his surroundings—it could easily be abused by people who lack the common sense to know texting and driving don’t mix. I’m sure for people more coordinated (and theoretically busier) than me, Email ’n Walk is a novel tool for composing e-mails while on the go. In fact, to that end the application works very well, offering a relatively clear view of what’s in front of you. One of the tradeoffs of being able to clearly read what you’ve typed is that the background has a dark tint—in lower light situations this makes for a murky image. Email ’n Walk is only capable of composing new messages, then routing your message to Mail for actual sending; the app can’t handle replies or attached images. Email ’n Walk is a fun e-mail toy for writing short messages, but you might be better off exercising common sense and standing still when tapping out your correspondence. Email ’n Walk is compatible with any iPhone running the iPhone 2.x software update.